I’m putting releases together for the show in Kamloops. Here are some tips to help before Valentine’s Day. 10 Tips to Mend a Broken Heart before Valentine’s Day ! 1. Get out and enjoy your life! The best way to heal yourself is to get out and do something. Explore your world and do your best to see love being shared all around you. It might seem lonely at first as you “walk through doors” by yourself, but the more you enjoy what you do.. the more people will want to be around you – and you’ll begin to really get your life back on track. 2. Exercise! Moods and ideas can get trapped into certain “postures” that we hold eg.sitting on the couch or staring at the computer. If you move your body it will subtly change your mood and then your thoughts. This is also a technique that I use in workshops and presentations when it looks like I’m losing the audience. I’ll walk to the other side of the room or stage so that the audience has to physically turn their heads or uncross their legs etc. to comfortably see me. 3. Eat Healthy! Yes, eating fruits and vegetables will both make your body feel healthier and increase your mood. 4. Find your color! We all have a natural mood or color that looks best on us. Find yours and you’ll be surprised to at how quickly you’ll begin to feel strong again. 5. Meditate! Seriously. It’s not just about calming the mind and controlling the emotions. It’s about putting the body into a state where it can heal itself and the pain will naturally fade. The first five are all things that we should be doing anyways to live a healthy and happy life that is attractive to both ourselves and then to the world around us. There are times however when even at our personal best, the world seems to crumble and the life we were building seems to dissipate in front of our very eyes. The next five are tips to help you through the tough times. 6. Make friends with yourself! Take some time and find out what makes you really tick. What do you like about yourself? What do you like to do? Who are you? 7. Repeat positive affirmations! It’s not that strange anymore.. really – it’s simply a matter of focusing on your goals and repeating them to yourself a couple of times a day. 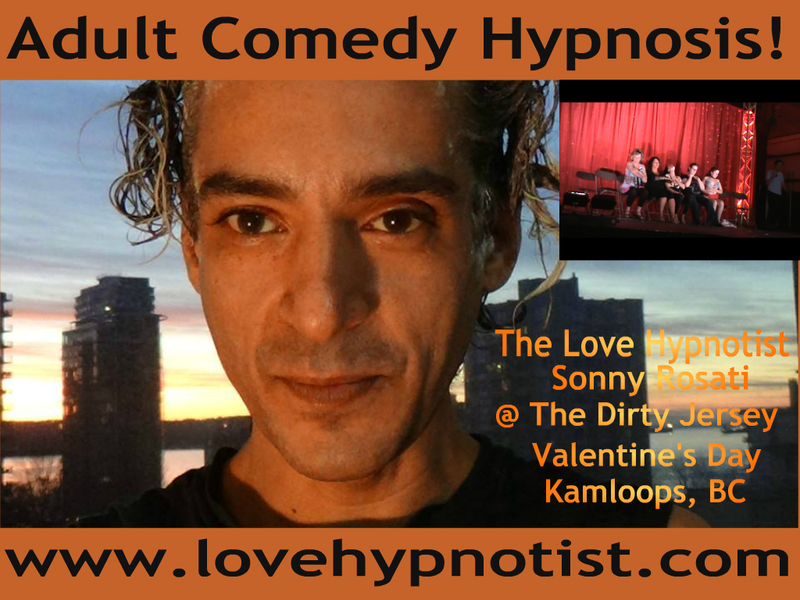 “I have a Dirty Hypnosis show in Kamloops on Valentine’s Day.. it’s going to be awesome!” and repeat. 8. Talk to someone! This might be difficult for a number of reasons but sharing is one of the pillars of life. And mending a broken heart is all about getting your life back. Remember.. the world is filled with conditions and power struggles but it has also forgiven almost everyone in some way. You’ll eventually be forgiven as well. 9.Forgive yourself! You can blame yourself all day long.. and for some – blame is all they have left of the relationship so.. that what they keep relating to. Let it go. You don’t have to love your ex. or how it ended but holding onto blame will pull you down. So let it go. 10. Control! You’ve lost an element of control in your life and it’s easy to be overcome with a desire to temporally pacify the pain by harming yourself or becoming excessively abusive to others. Try and resist. You can’t control everything.. but you can take care of yourself. And that’s where the healing begins.